The Syracuse University graduate is also a singer and stage performer. His breakthrough role came in the Tony Award and Pulitzer Prize-winning Broadway musical, ‘Rent’. Read on to find out more about his biography, family, wife, and net worth. Taye Diggs was born Scott Leo Berry on January 2, 1971, in Newark, New Jersey, to Marcia Berry and Andre Young. At the time of his birth, his mother was not married to his father. Later on in life, she married Jeffries Diggs, prompting her child’s change of surname to that of her new husband. Diggs grew up in Rochester, New York where he attended Allendale Columbia School. After seeing their child’s love and ability to act, his parents transferred him to the artistic School of the Arts. He went on to get a Bachelor of Fine Arts in musical theatre from Syracuse University. After graduating, Diggs moved to New York City where he began performing at the popular Lakes Region Summer Theatre in Meredith, New Hampshire as well as at the New London Barn Playhouse in New London, also in New Hampshire. He went on to make his Broadway debut as part of the cast of the 1994 Tony Award-winning revival of the musical Carousel. In 1995, he moved to Japan to perform in a Caribbean Carnival at Tokyo Disneyland. After spending a few months there, he returned to the US and took what turned out to be his breakthrough role, that of Benny in Jonathan Larson’s groundbreaking musical ‘Rent’. The musical’s success helped propel Diggs to greater heights as he transitioned from theatre to movies and series. He first starred in movies like ‘How Stella Got Her Groove Back’ (1998) opposite Angela Bassett, and then in ‘Go’ (1999), ‘The Best Man’ (1999), and ‘Brown Sugar’ (2002). For television series, he first appeared in the legal comedy-drama ‘Ally McBeal’ in 2001, for which he earned a nomination for an NAACP Image Award for Outstanding Supporting Actor in a Comedy Series. He went on to appear in another legal drama series titled ‘Kevin Hill’ which this time, earned him an NAACP Image Award for Outstanding Actor in a Drama Series. Other notable series include ‘Will & Grace’ (2016), ‘Private Practice’ (2007-2013), and ‘Murder in the First’ (2014-2016). Taye Diggs’ impressive Hollywood resume puts him among the top earners in the industry. He reportedly earned around $100,000 per episode of ‘Private Practice’, while he also took home around $80,000 per episode of the show ‘Kevin Hill’. So, it should be no surprise that the multi-talented actor has an estimated net worth of around $16 million. 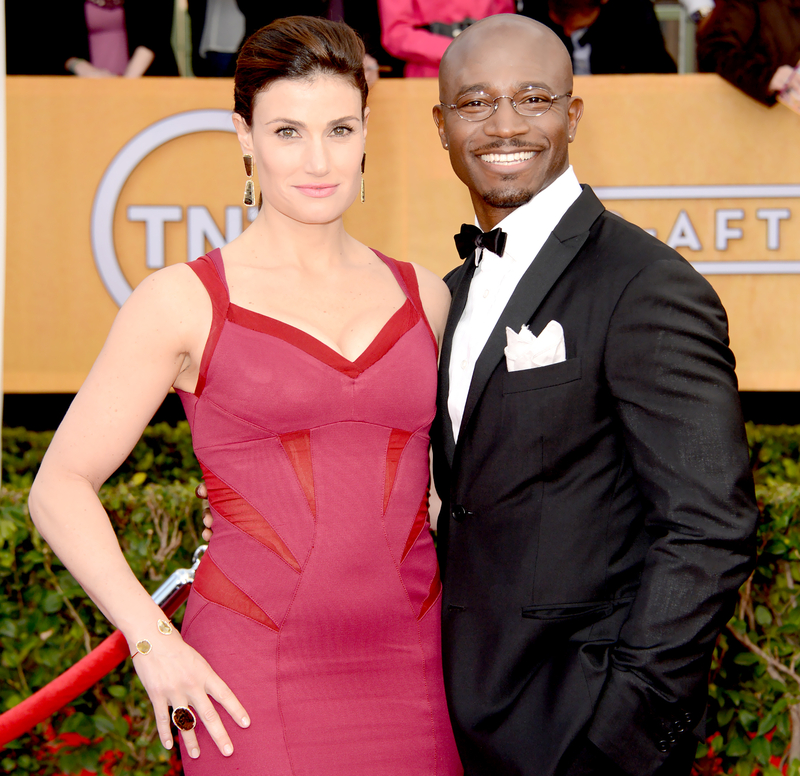 Taye Diggs was previously married to actress Idina Kim Menzel. The couple met while working on the musical drama ‘Rent’ in which they both starred in its movie adaptation. They got married on January 11, 2003, and together, they have a son named Walker Nathaniel Diggs, born on the 2nd of September 2009. Despite receiving criticism for marrying out of his race, Diggs has said his mother and Idina’s family supported their love and marriage. It all seemed like everything was rosy between the two until they separated after ten years of marriage. Their divorce was eventually finalized on December 3, 2014, however, the two continue to maintain a very close and cordial relationship as they have also mutually agreed to raise their child together. The exact reason for Taye Diggs’ separation and eventual divorce from his wife of ten years is unknown. Rumours have suggested that he was cheating on her or that he came out to her as being gay. The gay rumors were further fueled in 2013 during an appearance on Andy Cohen’s ‘Watch what happens live’ show where he somewhat spoke about what his man would look like. A caller asked the actor if he had ever been with a man to which he said no but however added that if he were to do so, he would look at someone like Tyson Beckford, Boris Kodjoe, Brad Pitt or Ryan Gosling. Read Also: Who is Brian J. White? His Wife, Age, Brother, Family, Net Worth, Is He Gay?